Jeff went through some of the holiday baking magazines that we've picked up over the last couple of weeks and went a little crazy with post-it notes to let me know what he thinks we should make. 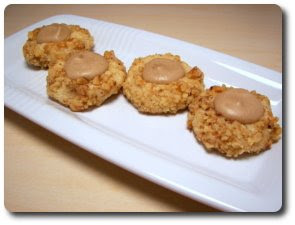 So, for this week's Wednesday Treat Day, I randomly picked one of those notes and opened the magazine to find these Maple Walnut Thumbprint Cookies. The dough for these is a basic vanilla-laced shortbread that is rolled into balls, rather than pressed into a pan or refrigerated to be made into slice-and-bake cookies. I found the dough to be a dream to work with - neither sticky nor dry - just moist enough to form a smooth ball. Once I portioned out the batch and gently shaped each buttery piece in my palms, they went for a dip in egg whites and a roll through a river of finely chopped walnuts. You can use whatever tool you like to make the indent in the center of the cookies, be it the back of a teaspoon or the end of a wooden spoon - however, I found it quickest to just go down the rows with my thumb. You don't want these to take on a lot of color in the oven - just lightly golden around the edges... this is enough time to set the cookie and gently toast the nuts. To fill up those divots in the center, a maple-flavored frosting combined of confectioners' sugar, butter, a pinch of salt (not too much, just a little to balance the sweetness), milk to thin and maple extract for that full flavor. 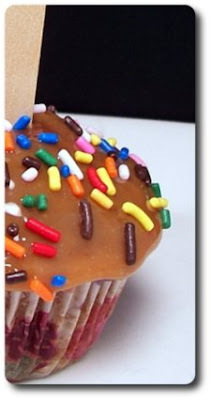 The extract is an excellent use in these situations as you wouldn't be able to use enough maple syrup to get that depth of flavor without making the frosting too runny (or sweet!). The texture of these two-bite cookies is tender from all that creamy butter, but not greasy at all - the walnuts that encase the outside added an alluring crunch while also bringing a delightful nuttiness. The once-pale frosting, now stained a light beige from the extract, was fairly sweet, but not cloying so as there was just enough added to fill in the centers. I'll have to see after they sit a bit longer to find out how stiff the frosting sets up - if it gets somewhat firm, it looks like the cookies should ship well, making them fun treats to add to the holiday baking spree! I'm thinking you could easily freeze the baked cookies, unfilled, a month or so ahead of time and then drop in that maple frosting before sending them out. If the frosting stays soft, I think they would be great as a fall-flavored bake sale item! Jeff walked through the kitchen just before I was ready to start plating dinner and said "Wow... something sure is sizzlin' over in that skillet on the stove!". 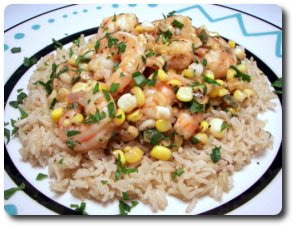 Ironic, I guess, because the name of the recipe I made for dinner tonight just so happened to be Sizzling Shrimp with Corn Relish! Mild shallots, minced garlic and a small jalapeño are slid into a slick of simmering hot oil - just a few seconds later, a load of shrimp are added and tossed around until they just begin to pink up. Three ears worth of corn are then added to heat through - once warmed and sizzling, the dish is brightened up by a mixture of fresh lime juice, salty fish sauce and a tiny dash of granulated sugar. Now, by accident, I left the fish sauce out on the island as I was finishing up... Jeff came by and didn't recognize it, took off the cap and gave a big sniff. Oops! He was not happy and thought I was going to ruin dinner, but I assured him it doesn't taste like it smells. "See! Better off if you just don't know." I said to him! 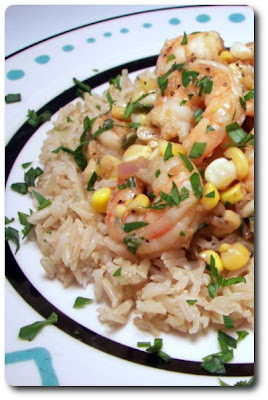 Seeing as this was going to be our dinner tonight, I had a pot of fragrant brown jasmine rice on the stove cookin' away (using the no-fuss method) to serve this over and bulk it up a bit. With a smattering of chopped fresh cilantro on top, you probably won't need more than 15 or 20 minutes before this clean and refreshing dish could be ready... talk about speedy! Well, that is, if you don't count the time needed to cook up the brown rice we had! If you wanted something a bit lighter, just spoon this over a bed of tender baby spinach (sounds like a good lunch to me!). 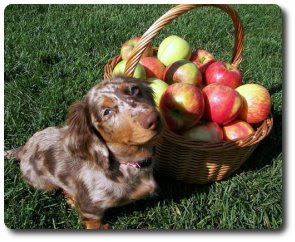 An apple a day... well, I think we need to eat more like 5! Do you remember what we did around this same time last year? 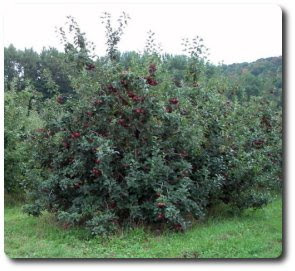 Yep, we kept with tradition and met up with my family again to go pick apples! Woo! 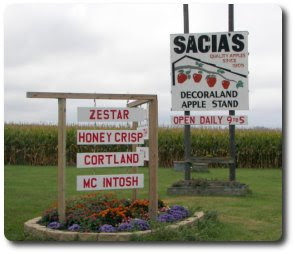 We made the drive down early yesterday morning to meet up with my family in Winona - we then moved through various locations to pick apples, see the sights and stop at a few craft stands. 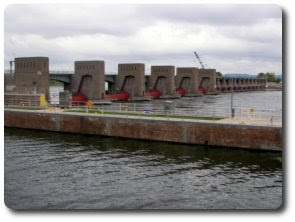 Get ready for a picture-heavy post! Another row that still looked almost untouched! 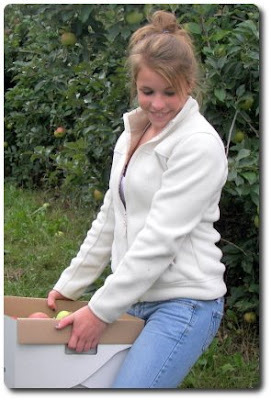 Our niece Bria came with this year - here she is luggin' a box they just started filling. 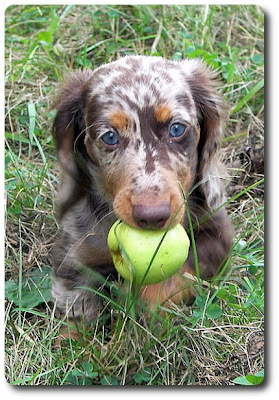 Here is Gus, quite limp and exhausted... he spent lots of puppy energy running around, helping us pick the apples. 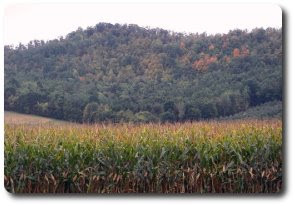 Just before leaving, we always try to get a shot of the mountains (well hills, I guess) that are full of trees - they have just begun to change, so I hope we get a chance to go back soon once they have turned into those beautiful autumn red, orange and gold colors. 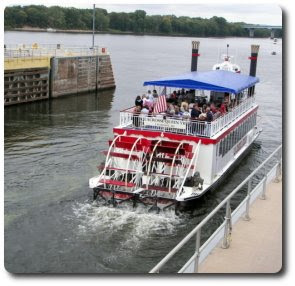 We happened to catch an old-fashioned paddle boat that was leaving the passage way. 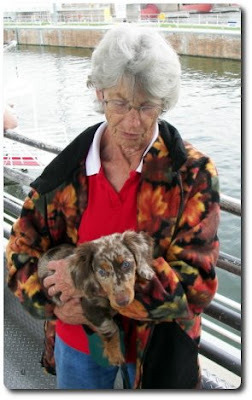 Gus also happened to get plenty of love from Mom... I think Jeff was afraid she was going to try and puppy-nap him back to the farm! 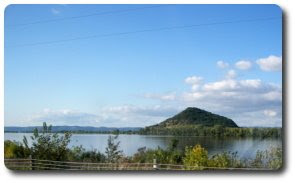 While it was pretty overcast when we started, it turned into a beautiful day on the way home... most of our drive back is along the Mississippi river, so we had gorgeous views the whole way. Dad, Jen and Steve were all too fast for the camera, so unfortunately we didn't get any snaps of them! 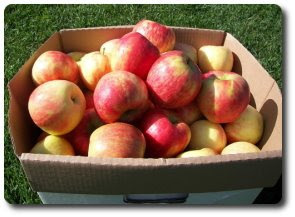 It was dark when we got home last night, but we took the apples out this morning so we could get a look at our haul. 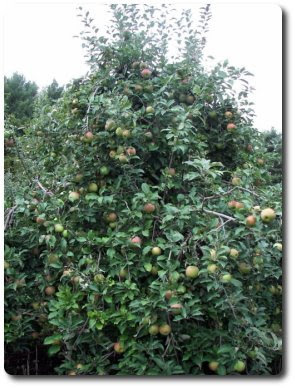 The varieties we ended up with were Granny Smith, Fire Side, Golden Delicious and a mess of our favorite, pictured below, Honeycrisp! 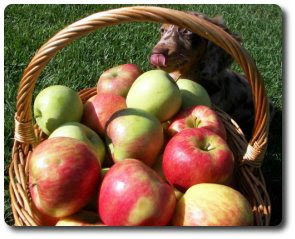 Then he decided was was hungry for some apples - look at him lickin' his chops! I also made dinner last night, so let's move on to that - a few weeks ago, I asked Jeff to pick up some endive from the store... sound familiar? While he was roaming through the store, he also picked up a few things he thought we needed because they were on sale... you know, M&M's, bananas (even though we had more than enough already) and a package of stuffing mix. I don't have a guess on how that fit in, but whatever! So, now I've been wondering what else I could do with that box besides the obvious. After browsing around for inspiration, a recipe for this Bruschetta Chicken Bake popped up and looked like it would be just the quick ticket for dinner after being out and about pickin' apples. I played around with the recipe a bit to add a little more depth, so here is what we ended up doing. To the stuffing mix, we added fire-roasted diced tomatoes, halved cherry tomatoes, vegetable broth and a few cloves worth of minced garlic. Rather than using all chicken breasts (which you could certainly do), I used a combination of breast meat and thighs - once sliced into bite-sized chunks, I tossed them over the bottom of a large baking dish and seasoned them with dried basil, crushed red pepper and fresh ground black pepper. I skipped any extra salt at this point because the box mix is fairly salty already. 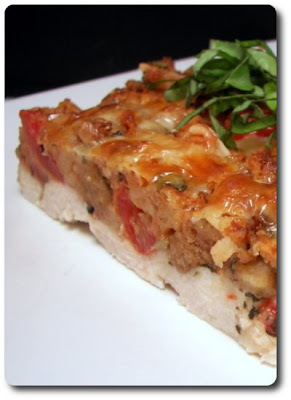 The moistened tomato and stuffing mixture is scattered on top of the chicken, followed by a sprinkling of Parmesan and a shower of Mozzarella cheese. Once it had a few minutes to rest after the trip through the oven, we were able to cut this dish into clean squares - the duo of chicken covering the bottom was still plenty juicy, the stuffing mixture on top was moist, yet not mushy and the cheese on top was gooey and browned. Topped off with a few shreds of fresh basil from the deck, we both thought this was quite good and comforting after a long day! 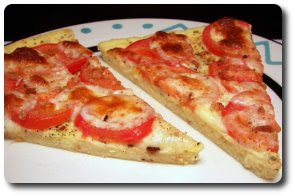 The cherry tomatoes added a pop of freshness while the canned fire-roasted tomatoes backed them up with a deep flavor. The original recipe called for using water to moisten the stuffing mix, but I used vegetable broth as I figured it would just add one more layer. We're pretty tired after a very busy day today... what did we do? Here's a little peek... we'll fill in the rest tomorrow once we've had a good night's rest. Well, I figured it was going to happen... when we made those Nutella biscotti to give away a couple weeks ago, Jeff was more than happy to send it, but since he loves biscotti, he was a little sad he only got a small taste. He's been dropping hints every day trying to slyly (not so successfully though!) let me know he wanted some of the crunchy cookies to snack on. 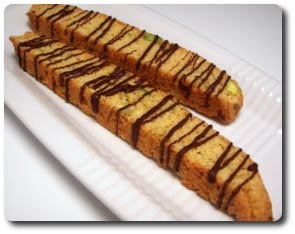 So, this morning I finally got to prepare a batch, except I decided on these Pistachio Biscotti since he liked those shortbreads so much we made back in mid-September. 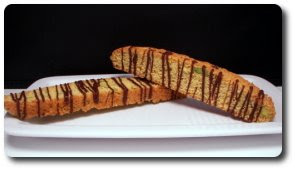 These biscotti use an interesting technique to create a tender, yet crunchy biscotti - a potent dose of sour milk! Usually the proportions for homemade sour milk (typically used as a substitute to buttermilk) are a cup of milk to a tablespoon of lemon juice (or vinegar) - however, this recipe uses an equal ratio of milk to juice. After scanning the ingredient list a couple times, I also noticed that the recipe did not call for any leavening from baking powder or baking soda - since every other biscotti recipe we made uses it, I decided to add a bit of each in. 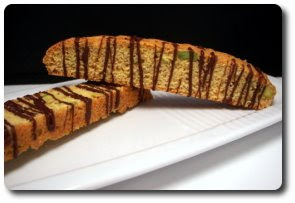 To add sweetness in this biscotti, brown sugar is used, rather than granulated sugar, which added a rich depth. To bring a little citrus zing in the background, a bit of grated fresh orange zest is also tossed in. While being baked twice gives the biscotti crisp texture, to bulk up that crunch is the addition of stone-ground cornmeal in place of a portion of the flour. Once the biscotti had gone through their first baking, cooled slightly and then sliced into long fingers, I stood the slices upright back onto the baking sheet for their second bake, rather than laying them cut side down. I've found this to be the easiest way as it allows air to circulate both sides of the cookies to dry them out - besides, who wants to bother with turning very hot cookies halfway through? For a little flare, once the biscotti had cooled, we drizzled one flat side of each cookie with a bit of melted bittersweet chocolate - you could probably increase the chocolate a bit and dip the bottoms too if you wanted a more chocolate punch! 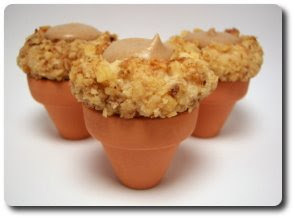 While they are naturally crunchy by design, the stone-ground cornmeal added an extra pleasurable bite that we both enjoyed. Even though they are crisp, they did have a tender aspect due to the addition of butter and that unique and strong soured milk mixture. I was planning on bringing some over to the neighbors to share, but Jeff has given the big veto stamp on that idea as he wants to horde these for himself! Humph! 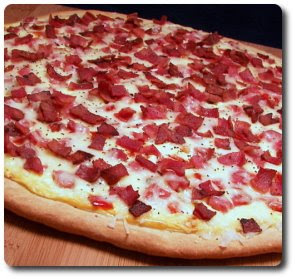 No surprises here... it's Friday Night Pizza time! And yes, I was reminded bright and early what day it was before someone drove off to the office this morning - hmm, I wonder if this really was a good idea? 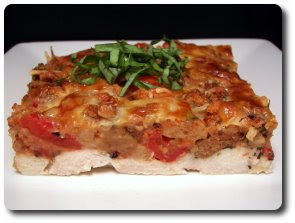 Unlike last week, this time I got to toss together our favorite whole-wheat pizza dough for this Breakfast Pizza dish! Once that was off and rising, I had plenty of time to get the rest of the toppings together. If I were to ask Jeff what his favorite breakfast food would be, I would bet all my money on an ecstatic reply of "Bacon!". So, you can imagine how excited he was as the aroma of the smoky pieces raced up the stairs (followed by him running down to see what I was doing) soon after the skillet warmed up. Once the bacon was done, we removed the crispy bits and drained off all but one tablespoon of the intense drippings, giving us just enough fat to sauté a handful of chopped red bell pepper and green onion. Once the dough was ready and stretched out into a rough circle (no need to be perfect), we gave it a quick pre-bake just to give it a head start. On top of the semi-set dough went a thick layer of herb-flavored cream cheese spread that we loosened up with a couple eggs. The cooked vegetables were strewn on top of that creamy layer, followed by hearty chunks of cubed ham. We slid the assembled pizza back into the oven to cook long enough to set the cream cheese and turn the bottom of the crust crispy and golden brown. What about that crispy bacon? Well, we saved that, along with a mound of shredded white cheddar cheese, to be scattered on top once the pizza was almost done so the cheese stayed nice and gooey. Right before slicing, I scattered the top with fresh ground black pepper for a mild bite. While you could use a plain cream cheese spread, we thought the herb-flavored was a good choice to add another layer to the dish. That cheese layer was quite fluid as it went onto the crust, but the eggs helped it to set up well - kind of like a very thin and firm layer of savory cheesecake. Crispy crust (which was a pleasure as always to work with! 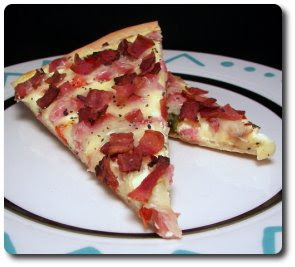 ), lots of salty bacon and plenty of cheese - I'd gladly eat this "breakfast" pizza anytime of the day... in fact, we have just enough leftover for both of us to enjoy a slice or two in the morning tomorrow. If you really don't want to bother with pizza dough or are short on time, a pre-baked crust you have in the pantry or which could be easily picked up at the market would be just fine instead (although, I do think you should give this crust a try!). Both of us love to snack on pears - when I buy them for a recipe that I plan on making later in the week, one of us usually snatches them up before I get a chance to use them. This happened again (it wasn't me this time though...) - I had to have Jeff stop by the market (well... he ate them!) 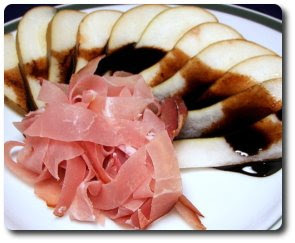 on his way home to pick one up so I could make this Pear and Prosciutto "Carpaccio" as tonight's side. While I know carpaccio is typically referred to using raw beef, veal or tuna, I didn't name this recipe - however, it does give it a fancy ring! Before I started working on the pears, we reduced a half cup of tangy balsamic vinegar until the dark liquid turned very syrupy after a few short minutes on the stove. When that was almost done, I thinly sliced a crisp pear and neatly arranged the slices between two plates. A pile of ribboned salty prosciutto was mounded near the bottom and the thick syrup was drizzled over the top, staining the white flesh. Fresh ground pepper for a snappy bite is then sprinkled on top (which I forgot to do before the pictures - oops!) to serve. Very simple, yet quite elegant (screaming to be served at a dinner party if I do say so myself? 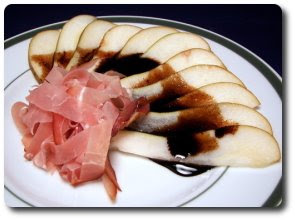 ), both of us loved the marriage of sweet pears, concentrated balsamic and the ever-pleasing prosciutto. I don't know if it would work well, but I'd love to try this again and work in some fresh figs (swoon!) when they start showing up at the market. I've had half a bag of tiny pita bread in the freezer for a bit and have been wondering what I could use them up in. 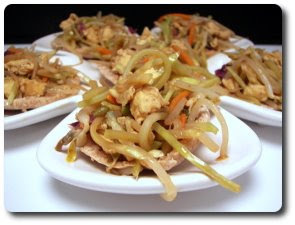 I was almost ready to just slice 'em up and bake them for pita chips, but decided we could use the little rounds with this dish of Moo Shu Vegetables I made for dinner. In a skillet drizzled with pungent toasted sesame oil, we added a few whisked eggs and let them cook just long enough until they were set, but still very moist. At this point, you are not really looking to scramble them - think more along the lines of an open-faced omelet. The eggs are turned out and fresh ginger, along with a couple cloves worth of minced garlic, are tossed in. Once their fragrant aroma reached my nose, broccoli slaw (which usually contains shredded cauliflower, carrots, broccoli and red cabbage if you've never had it), bean sprouts and green onions are stirred in. To season the mixture and help soften the veggies with steam, soy sauce and rice vinegar are poured into the skillet. Once tender, the round of cooked eggs are added, along with a couple tablespoons of thick hoisin sauce, and the mixture is tossed around the skillet to incorporate the ingredients and break up the eggs. 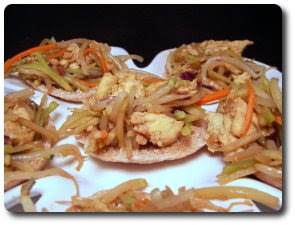 You could serve with whole-wheat tortillas, but we piled the mixture on the split pitas for a fun presentation. While Jeff and I both thought this was good and quite healthy, it needed a little attitude to liven it up as it was just kind of plain - maybe a couple dashes of sriracha to give it a little kick or maybe just a bit more hoisin? 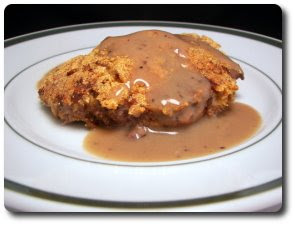 There is one comfort food dish that we have not had in a very long time... in fact, Jeff just mentioned this past week with the changing of the weather that he would love to have a good Chicken-Fried Steak and Gravy for dinner one night. I remember the last time I made a recipe like this - it was years ago and while tasty, it was also deep fried and not too healthy. While it is always nice to indulge in the true fried version, this lightens the dish up enough, but not so much that you end up with something that is unrecognizable. So the crunchy coating has something to grab onto, cube steaks are first dusted with flour and go for a quick bath in a couple of beaten egg whites. The steaks are then dragged through a combination of cornmeal, white whole-wheat flour, cornstarch and paprika. Rather than drowning them in hot oil, the coated steaks are browned on each side in just enough oil to give them a golden crust. They will not be entirely cooked through at this point, so to finish them off and keep the crust crisp, they are placed in the oven for just a few minutes. This gave us just enough time to create the wicked gravy we served on top. Into the skillet, with all those caramelized bits stuck to the bottom, beef broth is poured in and brought to a boil - this will loosen those flavorful bits and begin reducing the amount of liquid to concentrate the broth's flavor. To tighten the gravy, a slurry of cornstarch and water is whisked in - after given a minute to thicken, a couple shots of half-and-half are swirled in for a silky body. 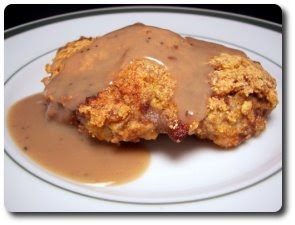 For a lighter take, we were quite content with this twist on chicken-fried steak - I served this with basic smashed Yukon gold potatoes on the side to enjoy the extra gravy... talk about comfort food heaven without feeling as guilty afterwards! It is that time of the year (already?!) where the holiday baking and cooking magazines are beginning to flood the market. This means it is a fine time to start testing out new recipes for our yearly holiday baking spree! 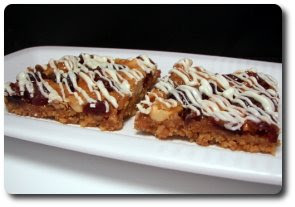 Just saying the name of these Cranberry Pretzel Cashew Bars sent Jeff into a tizzy - lots of his favorite flavors all packed up in a tidy little bar. He was none too happy to find out most of them are being sent into the office for the Weekly Wednesday Treat Day! To provide a sturdy, crunchy base, I blitzed loads of salty pretzels in the food processor to finely crush them - you could also do this with a zip-loc bag and a heavy rolling pin. Brown sugar and liquid gold, a.k.a melted butter, are combined with those crumbs so they all stick together - to provide a little extra strength and prevent sogginess, a bit of beaten egg white is then mixed in. Once the crust was partially baked, we scattered the hot top with chewy dried cranberries and lightly toasted cashews. To glue those two to the top of the pretzel base, a bit more butter and rich brown sugar are brought to a boil and poured all over the top. It may look like there is not enough, but just do your best to evenly pour it over the top. Once the pan goes back into the oven, the heat will melt the mixture again and it will bubble and spread to all the naked nooks and crannies. 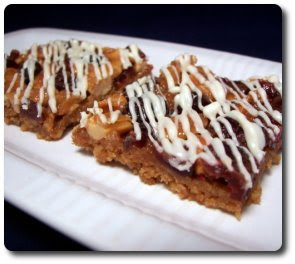 To dress up the slab of bars, we drizzled the top with melted fine-quality white chocolate and once given enough time for it to set, sliced them into neat squares. The caramel layer on top is sweet, the pretzel base is salty, the cranberries add chew (and a bit of sweet tartness), while the cashews add crunch and a nutty punch. Simply put? A p-a-r-t-y in the mouth! The drizzle of white chocolate was a wonderful contrast, but if you dig bittersweet chocolate more, don't let me stop you from loading it on instead. If you really want to add a fancy (and expensive) twist, exchange those cashews for roasted macadamia nuts to highlight their buttery crunch. While I've expressed our love for leftovers to you before, some days we just want a simple fluffernutter or another kind of "plain" lunch. 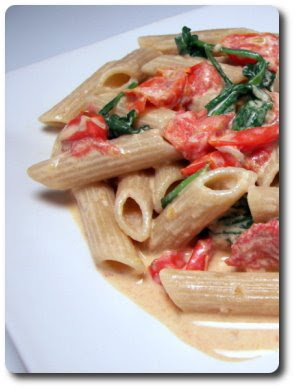 Since there are just two of us here, I'll often seek out recipes that only have two servings or can be modified to be for such occasions, just like this Penne with Spinach, Cherry Tomatoes and Gorgonzola Sauce I made for dinner tonight! Use your favorite large pasta shape that resembles a tube - we used a whole-wheat penne for us, but you could also use a ziti or rigatoni pasta. While the pasta takes a dip in boiling water flavored like the sea, we tossed halved plump cherry tomatoes into a skillet, along with crushed red pepper for kick and a bit of minced garlic. Once you can smell the garlic, half-and-half and a few tablespoons of crumbled Gorgonzola cheese is stirred in. Gorgonzola can be pretty pungent and in-your-face, so you could swap that out with a more mild blue or even an ingredient like cream cheese to keep the flavor subtle, yet still retain a good mouth feel. Gorgonzola can be iffy with Jeff - sometimes it flies under the radar and he gobbles up whatever dish it is in, other times he will turn his nose and doesn't enjoy the taste. However, this dish tonight passed with flying colors - so fickle! 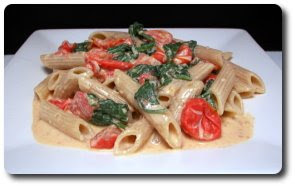 I liked the freshness the cherry tomatoes brought and there was plenty of that creamy sauce to go around. Feeling extra ravenous or need to serve more than two? You could easily scale this recipe up to serve what you need. Quite speedy to make, I almost wish I did double the recipe because I would have been quite satisfied with having another portion of this for lunch tomorrow! 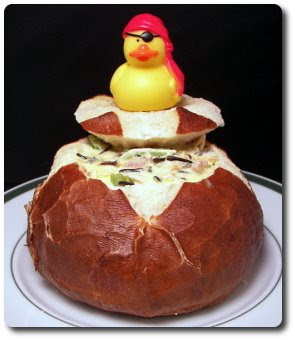 This week, we prepared 8 new recipes - our tops this time where those Caramel Apple Cupcakes, the Chicken and Ham Wild Rice Soup and the Steak Frites with Shallot Pan Reduction. Finally... we've come to another breakfast-for-dinner night! I don't know why I get excited, but it is just fun to do something that isn't alway so savory in nature for dinner. I should probably try and prepare a few "dinner-for-breakfast" dishes in the morning, but that just doesn't appeal to me as much for some reason! I chose these Poppy Seed Waffles tonight as those blueish-grey seeds call out to be every time I open the freezer and notice them sitting there sad and unused. I keep them there because they can go rancid fairly fast and while they probably wouldn't kill you if they did, who wants to do all the work in making a nice meal and have it ruined by a not-too-tasty flavor? Before we tossed the seeds into the dry ingredients, we covered the bottom of a small skillet with the pearls and let them quickly toast over moderate heat to intensify their flavor (just like you would toasting nuts, just a bit less time). While the original recipe called for using plain yogurt for the bulk of the wet ingredients, I used a scoop of thick and luscious Greek yogurt and vanilla yogurt as that's what I usually keep on hand in the refrigerator. The original recipe called for "plain yogurt" - so while the vanilla I used was sweetened, the Greek was plain and its richness negated the extra sweetness (or at least that was my plan!). 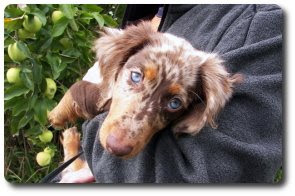 Since lemon and poppy are like two peas in a pod (see here, here, here or here for examples! ), a couple teaspoons of fresh lemon zest is added to the billowy batter for a bright note. Feel free to use either a Belgian or American-style waffle machine - we used the latter as the batter was a little light on the fat side and wasn't going to produce an extra-crisp crust you would expect with a Belgian waffle anyway. These were not floppy or soft by any means though - just crisp enough to know they are still waffles. Even though our machine makes 4 individual squares at a time, there was plenty of batter to make 3 full batches - to keep the waffles warm while I prepared the rest, I stashed them in a warm oven, on a rack, to keep them from getting soggy as they sat. 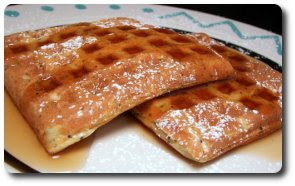 If you prefer extra-crisp waffles, but still want them without the added fat, you could send them through a short trip in a toaster to achieve that texture without loosing much moisture. 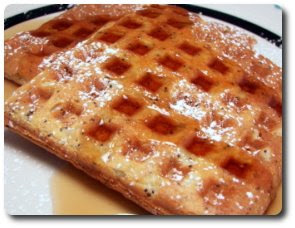 While a nibble of a plain waffle let me know they were just sweet enough as is, we enjoyed ours with a simple dusting of confectioners' sugar and drizzle of warmed pure maple syrup. However, I would love to try these again and serve with a fresh, homemade chunky blueberry sauce to take these over the top for a special occasion! As you know, yesterday was Jeff's birthday - we've made many different cakes for him over the years - the fun Mickey cake, that Devil's Food Cake with a ring of homemade Mint Chocolate Chip Ice Cream hidden inside and last year's outrageous Giant Chocolate Chip Cookie Cake. This year, I decided to ask him what he might like and he responded with "cupcakes!". Cupcakes... an excellent choice I thought, but now I had to figure out what to make! Jeff loves (I don't think that is even a strong enough word) caramel apples... every year after we do our big holiday baking spree I always make a few for us (him) to enjoy. So, to play off that idea, I decided to try out these Caramel Apple Cupcakes. These light cupcakes are flavored with individual spices that conjure memories of tempting fall treats - cinnamon, cardamom, ginger, fresh grated nutmeg and clove. I didn't want any apple chunks in these cupcakes, so to give a smooth apple flavor, applesauce is used as part of the wet ingredients to impart that flavor. In addition to the melted butter, a bit of sour cream is used to keep these cupcakes tender and very moist. Rather than a traditional buttercream frosting, we upgraded his birthday cupcakes by smearing the crowns of each with creamy melted caramel. You'll need to try and work quickly as the caramel will begin to set, but don't be too concerned if the phone rings or someone comes to the door. 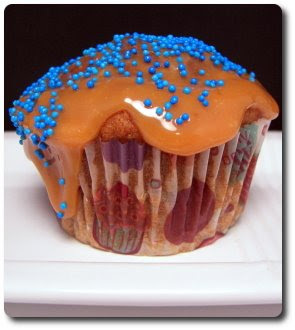 If the caramel in the bowl begins to set before it gets onto the cupcake, just gently rewarm the mixture to loosen it up. 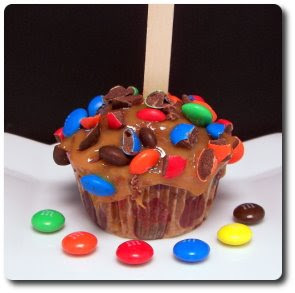 One of Jeff's favorite candies is M&M's, which his regular caramel apples MUST be rolled in, so I chopped up a few and scattered them on a couple of the cupcakes - the rest were showered in nuts or sprinkles (and yes, those are Mickey-shaped sprinkles...). 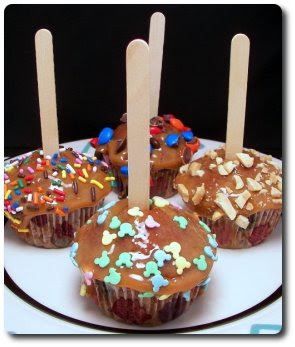 To complete the theme, each cupcake gets is skewered with a popsicle stick to give that caramel apple look. Since it also was officially "talk like a pirate day" on his birthday (inside thing with his co-workers! 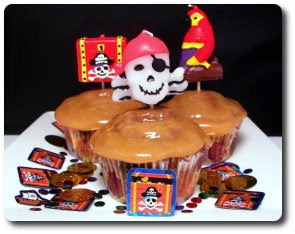 ), I did switch out some of those sticks with these pirate-themed candles I put on a toothpick... hee hee! Arrr, tis' that time o' the year again... tis' Jeff's birthday today, argh! Sorry... I couldn't help it - Jeff's birthday just happens to fall on the official Talk Like a Pirate Day (which also happens to be some inside joke at his office with him)! I'm sure he'd love a full post of pirate speak, but I'd go crazy having to type it all out... so we'll just do a pirate themed birthday instead. 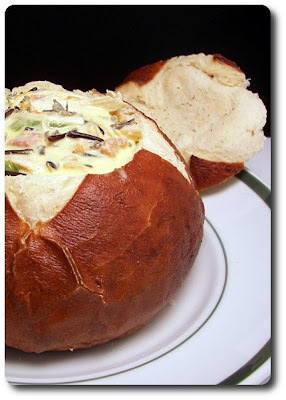 Anyway, Jeff has been asking for a creamy wild rice soup for some time now - so for his birthday dinner tonight, I made this Chicken and Ham Wild Rice Soup. This creamy soup starts by melting a couple knobs of butter and tossing in a mirepoix to soften - this is just a fancy name for the combination of carrots, celery and onion. To help tighten the soup later on, a few tablespoons of flour are stirred into the vegetables and allowed to cook for a minute to remove that raw flour-y taste. Half-and-half, chicken broth and a shot of sherry to perk things up are stirred in, followed by cooked wild rice, shredded chicken and cubes of cooked ham. After the liquid dances and grooves in the pot for a few minutes to bring all the ingredients up to temperature, I tasted and added a bit of salt and fresh ground black pepper to enliven the flavor. 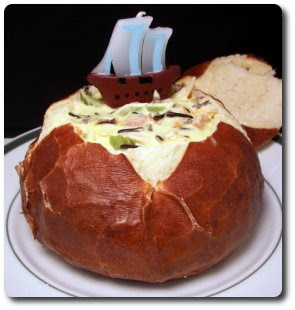 While served in a soup bowl is certainly reasonable, to make this a bit more special, I carved out the innards of a crusty pretzel bread bowl and served the soup inside! Using a combination of chicken broth and half-and-half blessed the soup with a voluptuous body, while still keeping it fairly light and flowing. 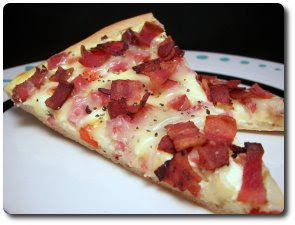 The cooked ham added a salty and slightly smoky flavor while the chicken added extra protein and texture. Tender, yet chewy black grains of Minnesota-grown wild rice added to the hearty nature of this soup, also lending a distinctly nutty essence. Wild rice, if you've never made it before, is cooked in a large volume of broth (or water) for a fairly long time - usually around 40 to 60 minutes, depending on the variety and size. Look for the cooked grains to just begin to split and puff open, exposing its translucent innards - too much longer after that and it can get a little mushy. To get the amount needed for this recipe, use roughly 1 cup of the dry grains. Wild rice is considered a whole grain - it is rich in fiber, protein, lysine and also has the benefit of being gluten free! Still not convinced you would like it? Try using mixture of half wild rice and half brown rice the next time you cook up a pot for a pilaf or side dish and see what you're missing! And yes, he got some special treats too... we'll talk about those tomorrow though - here is a sneak peek! Friday night pizza... on Thursday! Due to an occasion tomorrow and since we still wanted to do a pizza this week, I had to prepare the Friday Night Pizza a day early... woo! While I'm a big fan of our favorite whole-wheat pizza dough, tonight's pizza, Tomato Polenta Pizza, went in a different direction in the crust department. A smooth, firm layer of "polenta" forms a creamy, set base to adorn the top with luscious slices of fresh plum tomatoes and thin strips of mozzarella cheese. I say "polenta" because this version doesn't actually use cornmeal, which is what I go to when I think of polenta. Instead, this version uses fine semolina - a.k.a pasta flour - which is finely ground durum wheat. Semolina has the benefit of a very fast cook time and while it doesn't necessarily have the same exact flavor, we didn't think it was that much of a stretch! Rather than using water to cook the semolina, we used milk for an ultra creamy texture - once you drizzle the fine grains into the pot, don't stop stirring because it will thicken almost instantly. Since the mixture is fairly dense at this point, a couple eggs are stirred in to lighten the mixture, along with a handful of fresh grated Asiago cheese to melt in for a nutty flavor. We spread the mixture in a large pizza pan - if your pan has holes in the bottom, line it first with foil or parchment paper so it doesn't get pushed through them. If it seems difficult to spread evenly, lay a couple strips of saran wrap on top and just used your hands to push it around. You'll want to do this at least a couple hours ahead of time so the mixture firms up and holds its shape. Before we layered on the tomatoes and cheese, I crushed a bit of dried basil leaves and scattered them on top. The original recipe called for seasoned breadcrumbs to be scattered on top before the assembled pizza went into the oven, but I smashed a few garlic-and-herb seasoned croutons to use instead. Baked until the cheese is gooey and golden brown, I was easily able to slice the pizza into wedges and the slices were sturdy enough to pull out each without falling apart! 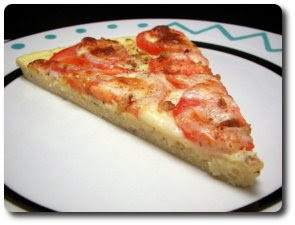 The acidity from the fresh tomatoes on top was a nice, sharp contrast to the velvety base - I didn't know if the "crust" would end up being tough due to the second bake after being already cooked in the pot, but the semolina held up quite well and my concern was for naught. The eggs worked well to give the semolina mixture lift and retain a light texture. I also thought the use of the breadcrumbs (well in our case, seasoned croutons) on top was an awesome idea and one I'll be using again. 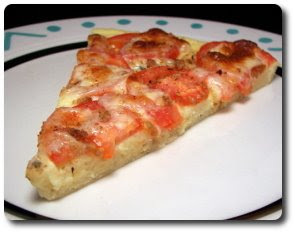 I have a killer plan for lunch tomorrow now - I think I'm going to heat a skillet with a drizzle of olive oil inside and add the pizza slices - this way the semolina bottom gets golden and crisp while the cheese and tomatoes can gently rewarm from the bottom up... hurray for leftovers! Meat and potatoes... but with a few twists! 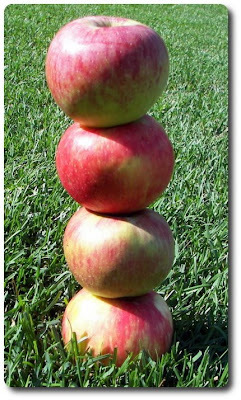 Short stack... but not pancakes! Do you need a reason for cake? Cookies and baked pasta... what a way to warm up! 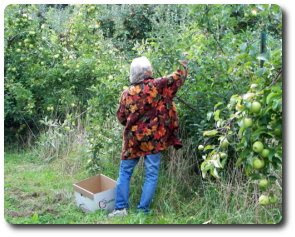 Brr... the seasons are a changin'!